I am so excited to share this make up review with you! Benefit recently launched a whole new selection of brow products and lets face it you can never own too many brow products especially when they look this good! Product | Ok so if you haven't noticed my eyebrows are kinda non existent and before you assume I never in my life have over plucked these brows, they just don't grow. So I am always trying out new brow products to give me some shape. I love this gel consistency, it glides on so smoothly and perfectly carves out a polished arch and structured overall brow. I even love the built in angled brush, what a perfect travelling product don't cha think? The gel is definitely buildable and lasts all day long! Ive been using this now for around 3 weeks and I actually think I prefer it to my Anastasia Beverly Hills pomade, the formula is so much easier to work with. I bought this in shade 2 after the lovely sales associate matched it to my brows but there are 6 shades to choose from. Packaging | Benefit are known for their super cool packaging and KA-BROW! does not disappoint. 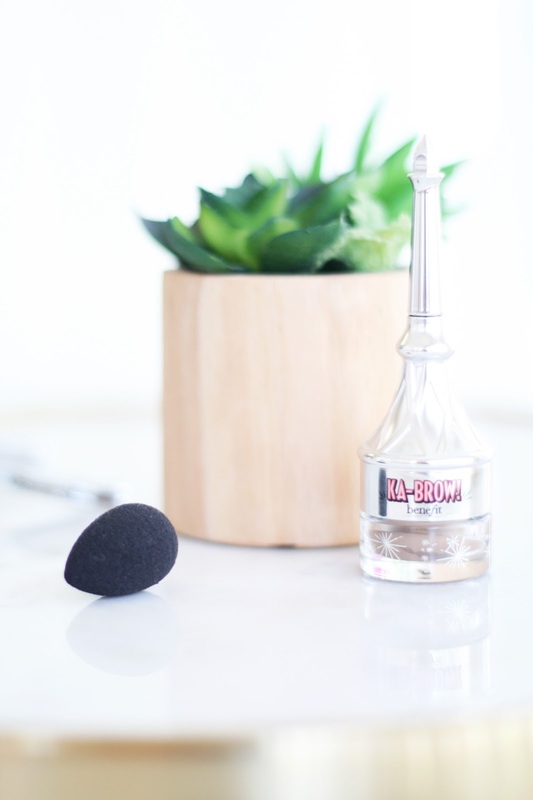 A small pot with a brush hidden inside is such a great idea, I don't know why but I never usually like brushes that come with products but I use the built in brush everyday. It's quite a hard angled brush so I can get my desired shape just right! Love it! Have you used this product? I would love to know what you think!